As usual photographing the boat attracted spectators, and they asked the usual question when told the Coraline’s length: “Is it really only 5.25 metres?” It does look bigger, and its overall length is actually 5.6 metres; Coraline is one of the few builders to use the lower figure when describing its product. Much of the difference in lengths is due to the massive bowsprit ahead of the roomy anchor line well. 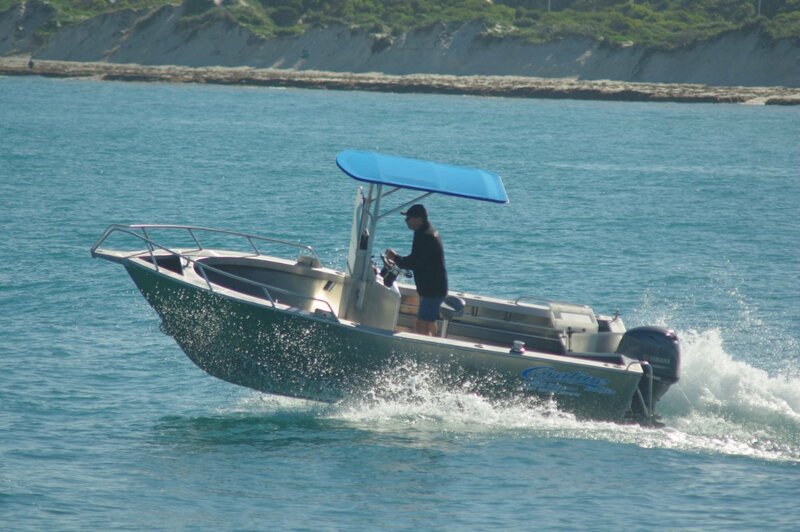 This example is destined to spend most of its life based at Wedge Island, hunting near-coastal fish and crays. Passenger accommodation comes a distant second to working room. Like many centre consoles this one has a couple of sockets to take a removable pedestal seat, but this seat was designed to take up minimal room either in use or tucked away to increase working space. It is not a lot larger than an old fashioned bike seat but, since centre consoles are usually driven while standing anyway, is more than adequate. The console is offset, giving passing room to one side and working room the other. A logical way to set it out as the console itself is sizeable, containing lockers on two levels. The dash above carries the VHF and the Garmin touch screen combo. The windscreen and the attached dash hinge forward for towing or for parking under low structures. The T-top above also stows; its supporting legs sink into sockets on the console. There are seats for two more in the shape of basic (carpet covered aluminium) quarter seats flanking the full height splash well. Slotting into the well’s front is a removable bait table. 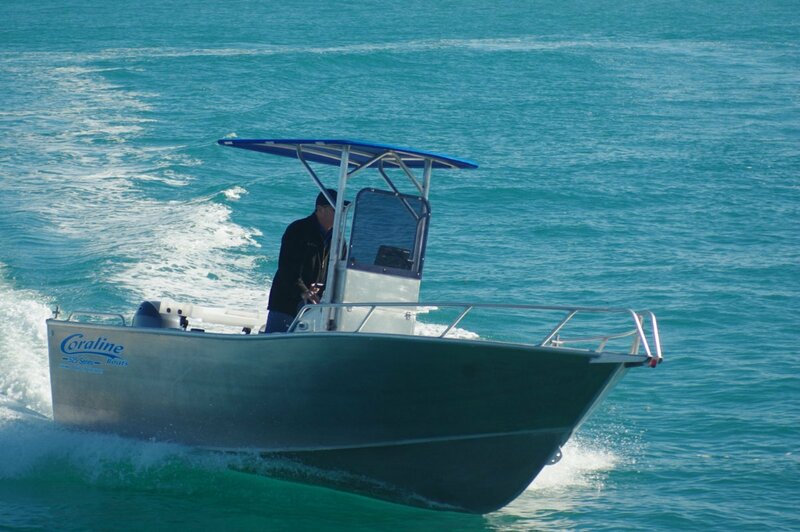 As well as the capacious centre console, beneath the forward platform and within the side pockets total far more stowage than any reasonable day fisherman could want or use. Eight aluminium rod holders in the coamings should similarly satisfy. Their multiple presence was enough to deter any impulse to fit rocket launchers to the T-top. 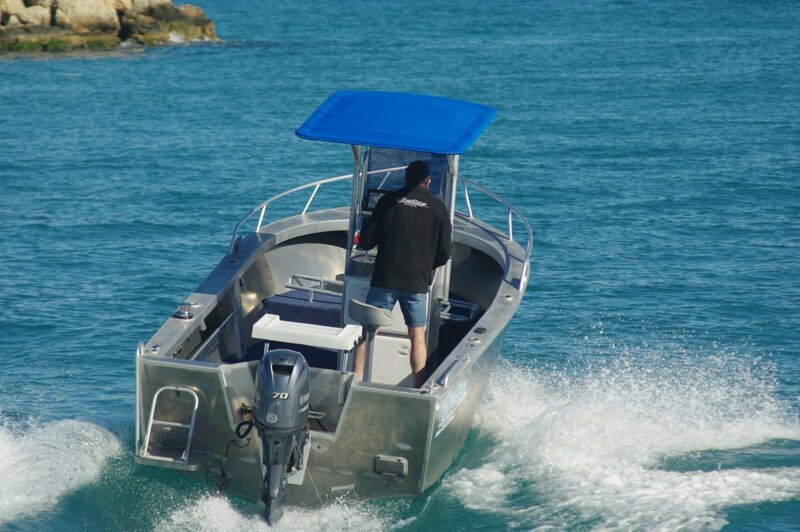 The 525 is equipped for effortless pot pulling, with an electric winch and a professional standard tipper; no gunwale roller for this boat. 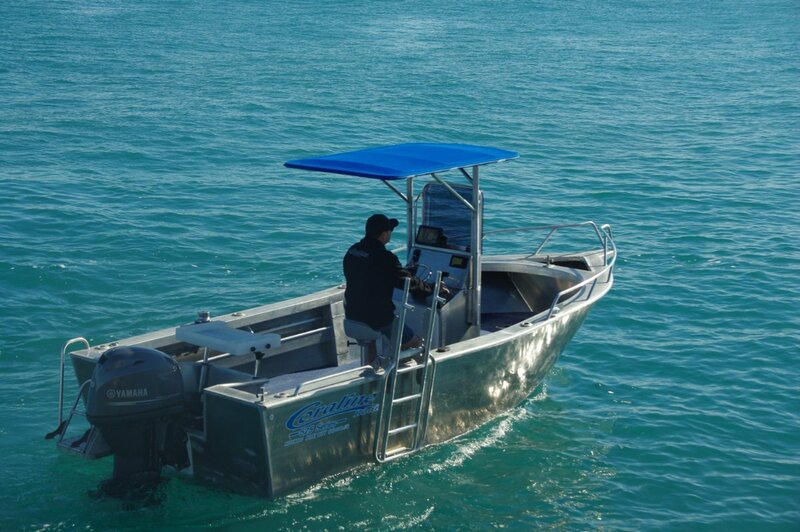 Aft of the console there is ample room for skinning, baiting and stowing a pair of pots. Maintenance has been considered, and almost eliminated. The motor, of course, and the likes of trailer wheel bearings will need regular attention, but apart from hosing down from time to time that about sums it up. The welded aluminium deck prevents oxidizing debris from insinuating itself, and the lack of paintwork means no scratched paint. My kind of boat. The 525, like all current Coralines, has the Series II hull. This was a transformational change from the original. Now with broad reverse chines and a deeper deadrise stability is as good as ever and ride quality way ahead. We had pretty gentle conditions, but vigorous driving and the use of other people’s wakes confirmed the ride. Our spirited driving reinforced my pleasure in the effortless hydraulic steering. A Yamaha 70hp four-stroke powered the 525. It had the optional power steering - an excellent option if you have much manoeuvring to do. Likewise the stainless steel steering wheel with the all important knob for one-handed wheel turning. For beach launching, the aluminium trailer has been given an extendable draw bar. For recovery there are more options including towing the boat up the beach. The 4mm plate bottom can handle a lot of this. There are rails at bow and stern to ease the launch and recovery work as well as give security to passengers. Vital to beach launching is the transom ladder and boarding platform. The complete Wedge Island boat.